Welcome to The In-App Purchase Inspector – our regular look at free-to-play mobile game monetisation from the consumer's perspective. This time we're looking at Plarium’s turn-based squad RPG Raid: Shadow Legends. Best known for 4X games such as Vikings and Stormfall, (and its $500 million acquisition by gambling outfit Aristocrat in 2017), Israeli developer Plarium has always experimented with new genres. Over the years, it’s shown its sensitive side, releasing a surprising number of casual and social games including match-three puzzlers, builders and slots. But, at heart, its most successful games have always been about appealing to and monetising core, competitive gaming, and that pedigree certainly shines through in Raid: Shadow Legends. The first thing that impresses, however, is the game’s sheer graphic quality. It’s all about collecting and levelling up a four-man squad of fantasy characters (called Champions) and that is made very clear from the get go. Not only are the characters beautifully rendered and animated (although some may find the depiction of the female form unnecessary), but the 15 character classes - ranging from sub-types of humans, elves, orcs, lizardmen, the undead hordes etcetera - are also visually distinctive. There are also a lot of characters. 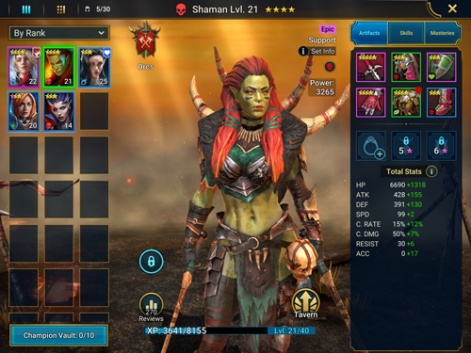 The game has launched with over 300, ranked from common to legendary - all characters can be consumed to levelled up more rare examples - and organised by their abilities: attack, defense, HP and support. In-and-of-itself this provides plenty of decision-making in terms of how to build a balanced squad, as well as all of the other typical RPG levelling sub-systems. These include an artifact gearing layer (up to nine slots per character), plus skills and masteries. That’s already a lot of additional resources to collect and grind, plus more decision-making in terms of how to use them. For most new players, however, just summoning new characters though the portal, which requires the collection of shards, is exciting enough. There are four types of shard, each summoning different champion rarities. Low level mystery shards are dropped for free every eight hours, but faster progression requires spending, with 15 ancient shards (plus bundled resources) costing $100. The same price will gain you five more valuable void shards, but the most valuable sacred shards aren’t for sale, apart from in specific bundles. Raid: Shadow Legends is already a top 100 top grossing game in North America, Europe, South Korea and China. As you’d expect, the other main purchasable resource is the gem hard currency, which can be converted into the silver soft currency, as well as energy, arena tokens, XP boosts and levelling potions. Raid also features a lot of bundles, of which the $10 starter pack particularly good value. That’s why there’s a one purchase limit per player. An even better deal is the $30 daily pack, which drops shards and other rewards every day for a week. In that sense, Plarium’s experience with its previous games is reflected in a very generous experience for new players, which generates strong feelings of reciprocity and - hopefully - long-term retention. Indeed, in the early days of the game, there’s little requirement to spend anything. Pretty much all activities, such as playing through the main campaign mode, fighting bosses in the dungeons, or fighting other players’ squads in the arena gifts many rewards. Players also start with an insane amount of energy. ‘Come in, play and enjoy our new game’, seems to be Plarium’s message. Of course, once players get deeper into the game and start to engage with deeper metagame loops, including the clan system and the need to grind out higher quality items and shards, monetisation does become more important. And Plarium has a well-designed layered structure to encourage players to spend and spend big. That’s why Raid: Shadow Legends is already a top 100 top grossing game in North America, Europe, South Korea and China. But for most players, there’s more than enough going on to provide a very enjoyable experience without spending anything.